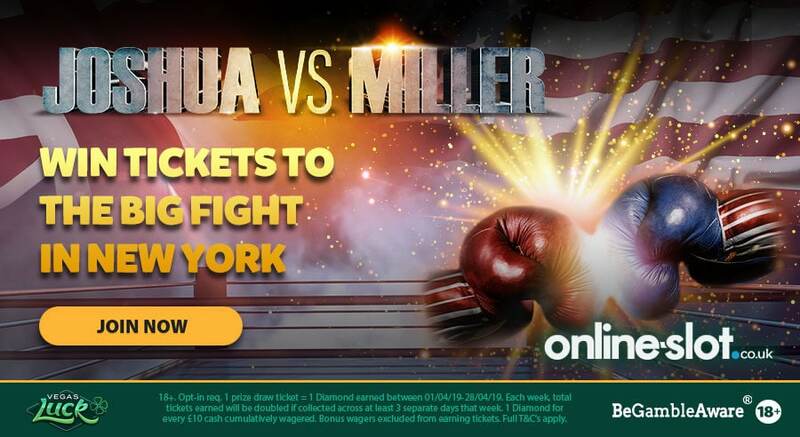 Anthony Joshua defends his world heavyweight boxing title against Jarrell Miller on the 1st of June (2019) and you and a guest could be heading to Madison Square Garden thanks to Vegas Luck Casino and their knockout New York Fight Package giveaway. The prize here is an absolute cracker and includes return flights from London Stansted with private check-in (Depart Friday the 31st of May 2019, return from JFK Sunday 2nd of June), private airport and hotel transfers, a pair of tickets to the fight (worth $750 each) plus a 2-night stay at the 4* Stewart Hotel next to Madison Square Garden. The winner and guest will also get an invite to the official VIP Friday night party on the rooftop of the Knickerbocker Hotel complete with access to a free bar, food and plenty of merchandise. The trip to the Big Apple isn’t all that’s on offer here either. There are plenty of other great prizes on offer too including a smartphone, a TV and loads of free spins. The free spins are worth 20p apiece and don’t come with any wagering requirements. If you’re a fight fan, this is a contest you really don’t want to miss. New players wanting to enter the New York Fight Package draw can do so with a top welcome offer. Sign up and you’ll receive 1 free spin on Starburst, Lights, Finn and the Swirly Spin, or Twin Spin Deluxe for every £1 you deposit, up to a maximum of £50. For example, if your first deposit is £50, you’ll receive 50 free spins. On top of this, you will receive 5 free spins on Playtech’s Eliminators. The free spins don’t come with any wagering requirements so everything you win is yours to keep. This offer isn’t available if you use Skrill or NETeller to make your first deposit so make sure you use your debit card.